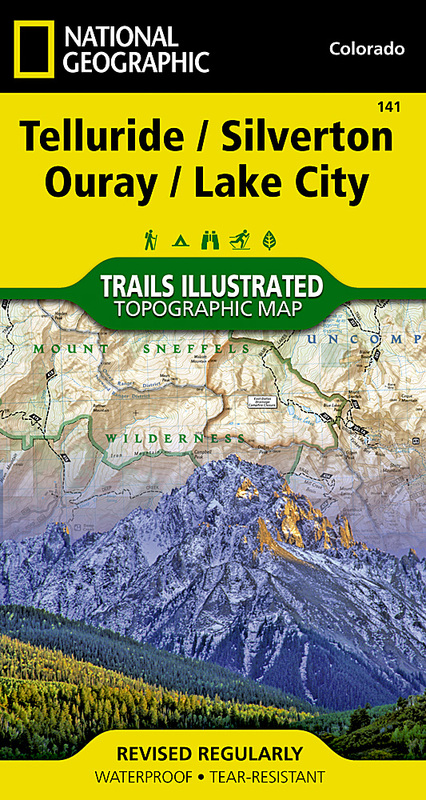 Expertly researched and created in partnership with local land management agencies, National Geographic's Trails Illustrated map of Telluride, Silverton, Ouray, and Lake City provides an unparalleled tool for exploring this breathtaking region of Colorado. Whatever the season, you'll find this map a useful tool in pursuing a host of recreational activities from skiing, snowmobiling, and ice climbing to camping, fishing, mountain biking, and ATVing. The map also includes information about these featured attractions: Uncompahgre Wilderness, Alpine Loop National Scenic Byway, Lizard Head Wilderness, Ridgway State Park, Mount Sneffels Wilderness, and San Juan Skyway National Scenic Byway. This map can guide you off the beaten path and back again with miles of mapped trails including the Colorado Trail and the Continental Divide Trail. The map base includes contour lines and elevations for summits and passes. Recreation features such as campgrounds, boat launches, and fishing access are clearly noted, and contact information for various agencies is included as well. Other features found on this map include: Cimarron Ridge, El Diente Peak, Gunnison National Forest, Handies Peak, Lizard Head Wilderness, Mount Sneffels, Mount Sneffels Wilderness, Mount Wilson, Redcloud Peak, Rio Grande National Forest, San Juan National Forest, Sunshine Peak, Uncompahgre National Forest, Uncompahgre Peak, Uncompahgre Wilderness, Weminuche Wilderness, Wetterhorn Peak, Wilson Peak.